These delectable Cheddar Biscuits with Chive Butter are a family favorite. 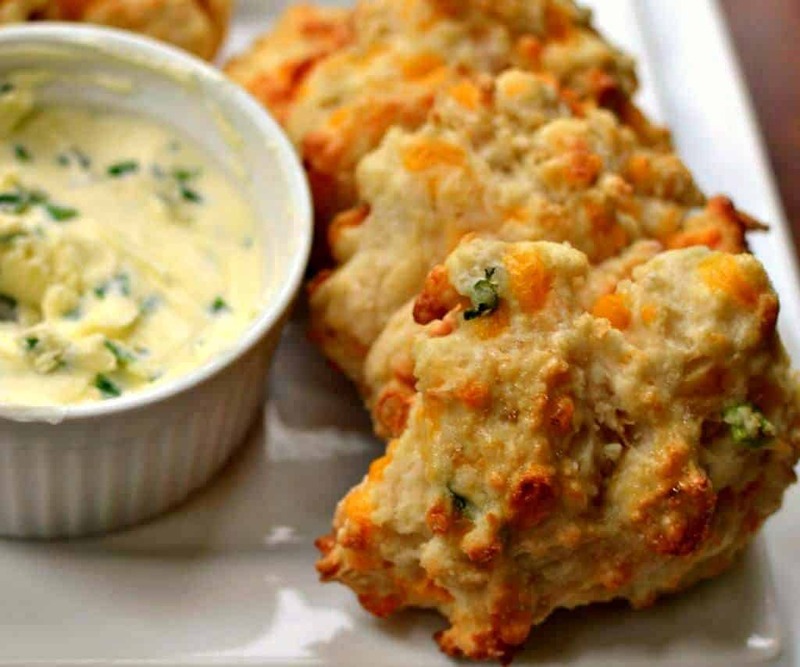 Just as delicious as Red Lobster cheddar bay biscuits without all the expense. 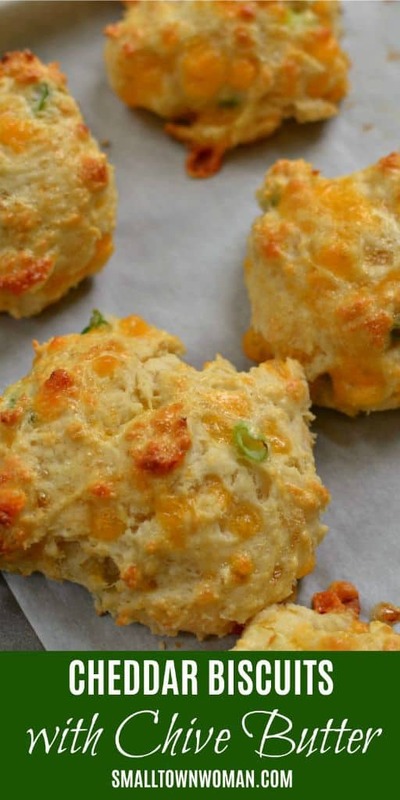 Don’t skip the easy chive butter as it really pushes these drop biscuits off the chart. 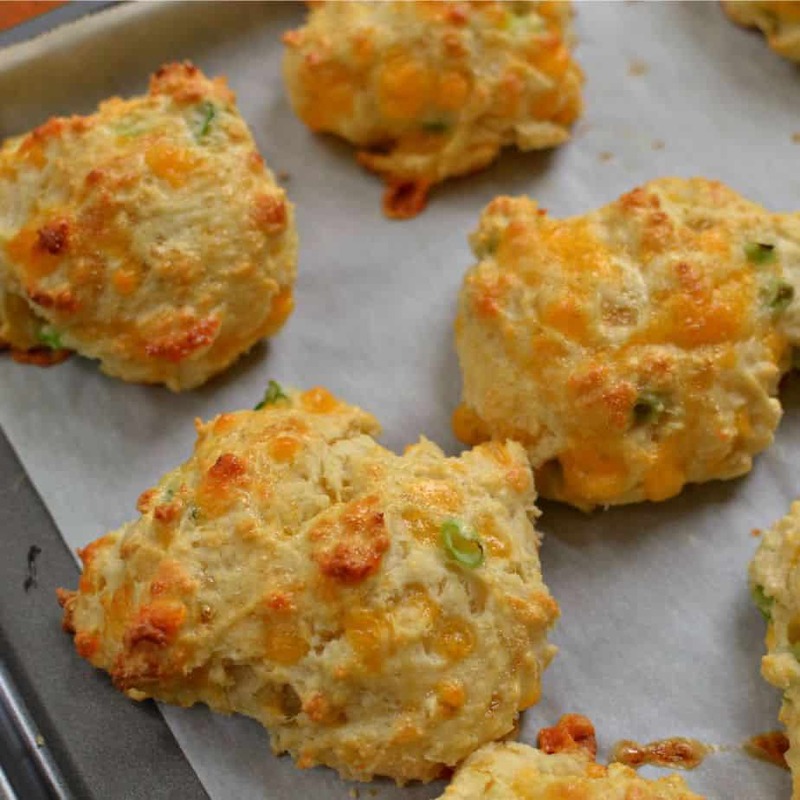 These Cheddar Drop Biscuits with Chive Butter are so easy you can whip them up real quick for your crew. You can even make the Chive Butter ahead of time so everything is ready to go at your convenience. 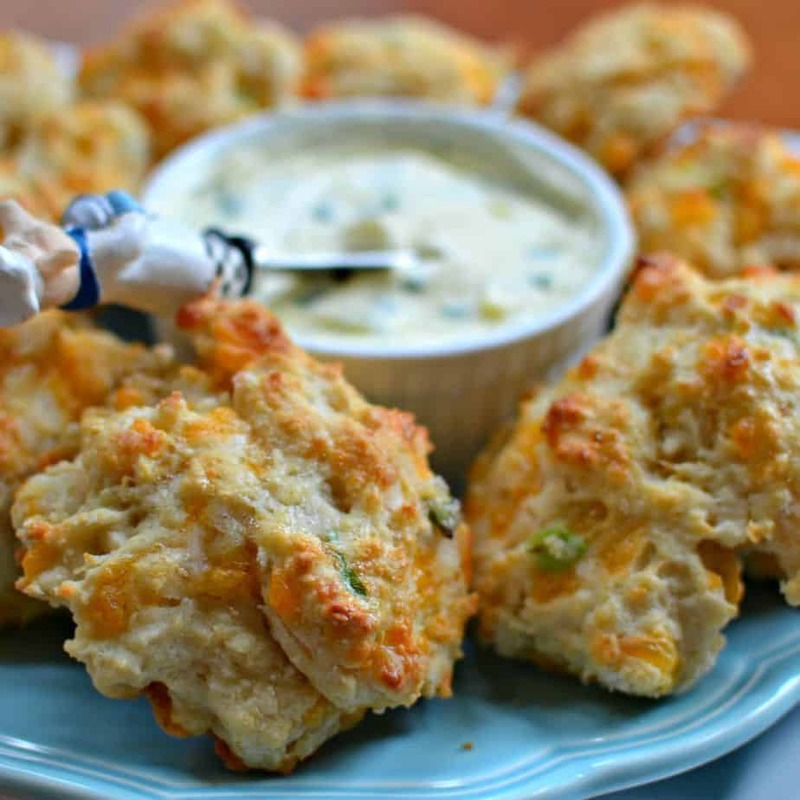 These Cheddar Drop Biscuits with Chive Butter are so divine I promise you will not be able to eat just one. They are crispy on the outside and super tender and moist on the inside. Now lather on that wonderful chive butter and you have yourself a little piece of heaven. How do you make Cheddar Biscuits with Chive Butter? First using a mixer cream butter until light and fluffy. Mix in the chives and spoon into a small serving container. Cover and refrigerate if you will not be serving within a couple of hours. In a medium bowl mix flour, baking powder, baking soda and salt. Using a pastry knife cut butter into the flour mixture until the butter crumbles. Stir in the scallions, cheddar and Parmesan cheese. Add the buttermilk and stir just until combined. Drop by rounded spoonfuls onto parchment covered baking sheets. Brush the tops with egg wash. Bake until golden brown. Serve warm with the chive butter. Chives are not to be confused with green onions or scallions which are the same vegetable. Chives on the other hand are an herb. Chives tend to be smaller and more tender, typically used raw, and only the green portion is used. They have a delicate onion flavor with hints of garlic. Can you substitute dried chives in Cheddar Biscuits? If at all possible I recommend fresh chives for this recipe. It really does add a lot of flavor and dimension to the butter. However I know that sometimes fresh herbs are not always available. If necessary you can substitute dried chives for the fresh chives in this fabulous recipe. 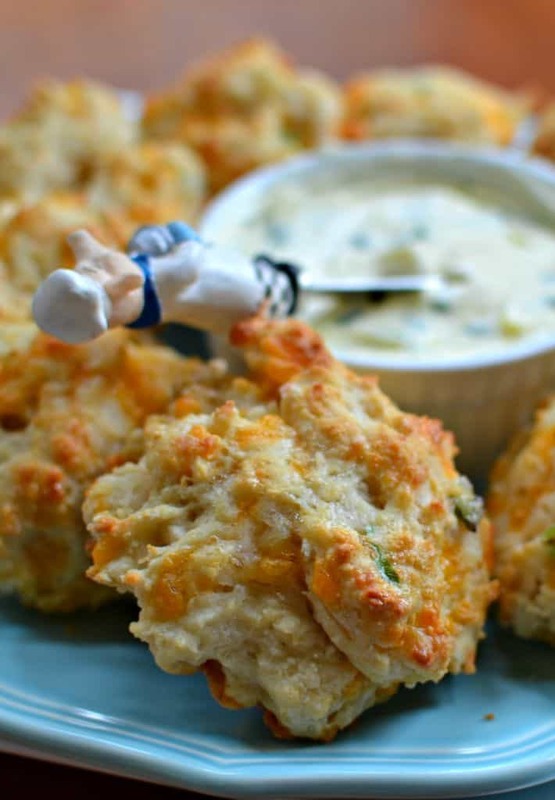 Helpful tips for making these Cheddar Biscuits with Chive Butter Epic! Use real butter not margarine or any other substitutes. If at all possible use fresh chives because they are so flavorful. Use good quality cheddar and freshly grated Parmesan. Don’t skip the chive butter because it takes this recipe over the top. You can make your own buttermilk for this recipe by combing one cup of milk with one tablespoon lemon juice or white vinegar. Let it set for five minutes before using in the recipe. These Cheddar Biscuits with Chive Butter would be perfect with a bowl of minestrone soup, baked chicken or chili. Scrumptious with sunny side up eggs and fresh smoked bacon. Delectable with beef stroganoff, Swedish meatballs and stew. Put the ingredients on your shopping list today and make your family something wholesome and comforting. Other bread recipes you will love! This post was originally published May 17, 2016 and was republished February 11, 2019 with new content. These were so delicious and flavorful! They were wonderful with our chili! These didn’t last long in my house! We love the flavors and texture of the biscuits. These are the best biscuits ever!! They are a huge hit here at our house. I absolutely adore these! Will def be making this, this weekend!!! This homemade version is beyond amazing! My favorite kind of biscuits! Always a hit! Cheddar? Fabulous!! I love the look of these biscuits. So flaky, moist, and tender. Can’t wait to make them! What a perfect biscuit! Love the cheddar cheese; so mouth watering! My husband will thank you for this recipe! It’s his favorite dish! These are the best biscuits! I want them before every meal. These biscuits are the best!! So, so yummy! Wowza! These look amazing! All those bits of cheese….heavenly! These look so good! Love them for a side dish!